Languages extension for the Connections Business Directory plugin. Languages is a feature focused extension for Connections which allows you to choose which spoken languages to associate to your entries. 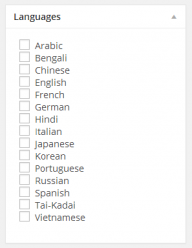 The languages can optionally be shown in a templates content block area. NEW: Add three more language per user request, Filipino, Indonesian and Slovenian. TWEAK: Use esc_html() rather than eac_attr() for escaping the language when displaying it. BUG: Load plugin textdomain on plugins_loaded action hook. BUG: Add a couple missing text domains.